Free Shipping Included! 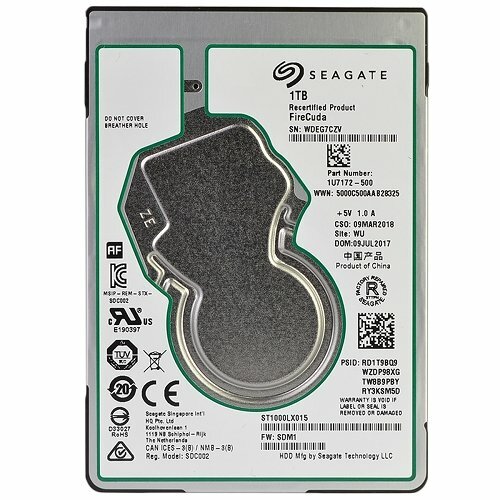 Seagate Solid State Hybrid Drive SSHD Gaming 1TB 2.5'' SATAIII 6GB/s 128MB Cache 7mm Thin Internal SSHD ST1000LX015 (Certified Refurbished) by Seagate at Andy Pemberton. MPN: 4336297719. Hurry! Limited time offer. Offer valid only while supplies last. Ferocious Performance Play faster, work faster. Seagate FireCuda 2.5-inch drives deliver a no-compromise mix of high performance and high capacity. Ferocious Performance Play faster, work faster. Seagate FireCuda 2.5-inch drives deliver a no-compromise mix of high performance and high capacity. Blending flash technology with a hard drive platform, FireCuda drives are the perfect upgrade for gamers, creative professionals and PC enthusiasts. Superior Storage With 500GB, 1TB and 2TB capacity options, FireCuda 2.5-inch drives make deleting games and files to save disk space a thing of the past. With 2TB you can store up to 80x 25GB games. Tireless Durability For over 20 years, the BarraCuda family has delivered ultra-reliable storage for the hard drive industry. FireCuda drives are protected by a best-in-class 5-year limited warranty.